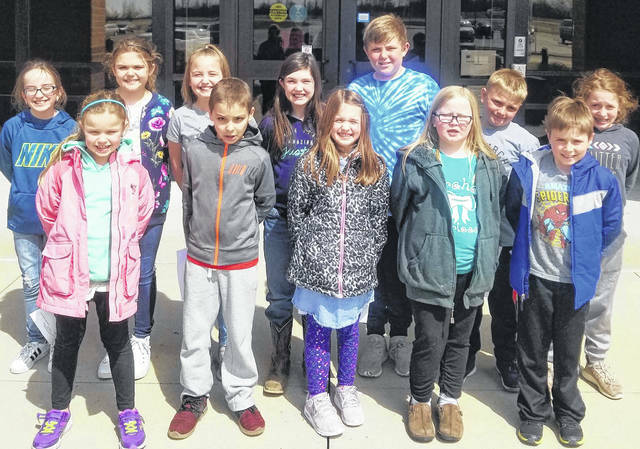 Graham Elementary’s Lighthouse Team includes, front from left, Hattie Uhl, Andy Lorenz, Reese Maurice, Melodie Moore, Daniel Spence, back from left, Maci Sadler, Bailey Britton, Lilah Turner, Avery Wolf, Case Teepe, Ryley Savage and Addison Wallen. ST. PARIS – Graham Elementary established a Student Lighthouse Team responsible for implementing leadership opportunities and promoting student leadership at Graham Elementary. Over the past year, the staff at Graham Elementary implemented “The Leader in Me” to promote student leadership each day. “The Leader in Me” is based on the “7 Habits of Highly Effective People,” developed by Dr. Stephen Covey and used in businesses. Graham staff members were trained in the program last summer. In March, the selection process for a student lighthouse team began. Students completed a lengthy application and requested confidential references from staff members. The applications from students in grades 2 through 4 were reviewed and 22 students were selected for interviews. From these interviews, four students from each grade level were selected to serve on the Student Lighthouse Team. Graham Elementary’s Lighthouse Team includes Hattie Uhl, Andy Lorenz, Reese Maurice, Melodie Moore, Daniel Spence, Maci Sadler, Bailey Britton, Lilah Turner, Avery Wolf, Case Teepe, Ryley Savage and Addison Wallen.